It’s a beautiful day here in Austin. It’s not too hot but not chilly either. There was a long list of to-do’s around the house and I got a few things done. Among them, pie. I wanted to make a fruit pie this week. My list of options for this seems to be getting more limited. I’m not a huge fan of peaches. I’ve done apple and blueberry pies. I’ve done bananas. Rhubarb makes me skeptical. Strawberry pie sounded like a good one take make so this is number twenty one. Preheat the oven to 400 degrees F and remove the dough after half hour. Roll out on lightly floured surface into a 13 inch circle. Transfer to a 9 inch pie dish. Trim the dough and use the remnants to patch any holes you might have around the crust edge or in the dish. Line crust with foil and add dry beans or pie weights and bake for about 15 minutes until the sides are set. Remove from oven, remove beans and foil. Heat oven to 350 degrees F and bake an additional 10 minutes until crust is a light brown. In a food processor or, using a blender and large bowl combine 1 cup of the strawberries and the water. Cover and blend or process until smooth. Transfer to a small saucepan. Bring to boiling; reduce heat. Simmer, uncovered, for 2 minutes. In a medium saucepan stir together sugar and cornstarch; stir in berry mixture. Cook and stir over medium heat until thickened and bubbly. Cook and stir for 2 minutes more. Remove from heat. If you want the red of the strawberries to pop, stir in enough red food coloring to tint a rich red color. I’m a naturalist. I opted out to the food coloring. Cool to room temperature. 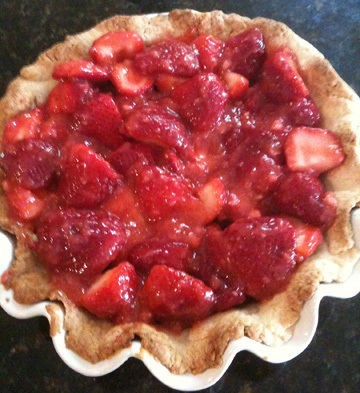 Fold remaining strawberries into cooled mixture; transfer mixture to pastry shell. Cover; chill for 3 to 4 hours. If desired (oh yes I do), serve with whipped topping. This entry was posted in Fruit Pies, Homemade Pie Crust Pies, Strawberry Pies and tagged Dessert, Pie, Recipe, strawberry by pieofthebeholder. Bookmark the permalink.